The 4 Keys to Weight Loss is a 1-2-1 weight loss transformation coaching program. Working alongside Barbara, she will create a bespoke week by week recipe plan tailored to your weight loss needs alongside her mentoring program to ensure you hit your goals. Barbara has been a weight loss coach since 2004 and has touched the lives of over 23 000 clients. Barbara has cracked the Weight Loss code and wishes to share her secrets and help you transform your body and reach your weight loss goals. The 2 week “TASTER” program offers an intense 2 weeks to learn basics and achieve great results. The 30 Day & 90 Day Programs offer 4 weeks of tasty recipes, motivational coaching and goal setting, education on portion control, exercise, mindset, daily choices to help improve your body to naturally lose weight and keep it off. This immersion program will set you up for a lifetime of permanent weight loss and feeling and looking 10 years younger! The 4 Keys to Weight Loss program was featured in the Daily Express Newspaper and continues to inspire, educate and motivate people across the globe on healthy eating, exercise, tricks and hints that motivate you to permanently lose weight and keep it off! 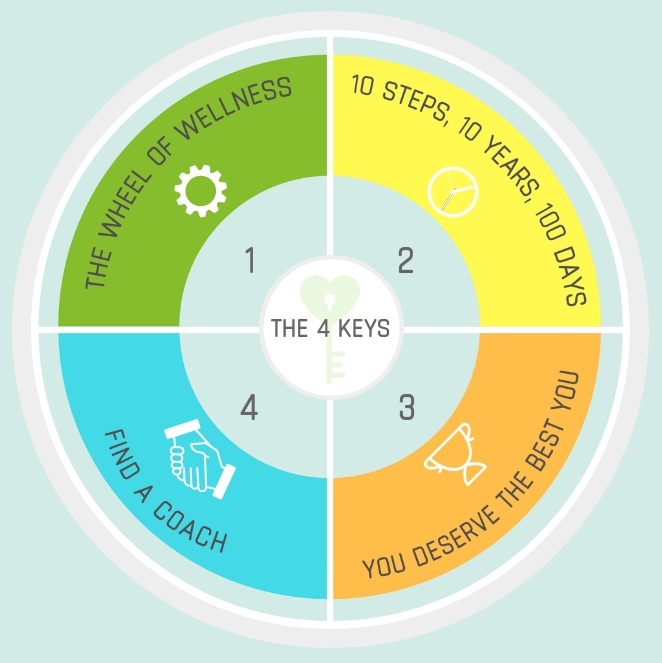 The 4 Keys to weight loss explained…..
Barbara runs through the Wheel of Wellness which has 10 sections to make sure each area of your life is in balance. Barbara tailors your program according to the findings. The next step is to go through my 10 Steps to look & feel 10 years younger, which includes your goal setting. Mindset and believing you deserve the very best for yourself is a big part of the program and daily motivation from Barbara’s 1-2-1 coaching will help your get over any stumbling blocks you may come across.